Have you heard of Split? If the name is unfamiliar, don’t worry. I didn’t find out about Croatia’s second-largest city until less than a year ago, after deciding to go to Dubrovnik. I wanted to see more of the country and was looking for a launch point to land and sea adventures. Split met all my marks for a solo traveler’s ideal destination. It’s easy to reach on public transportation. It’s got ambiance—the city is home to impressive ancient ruins overlooking the Adriatic Sea. It has amenities, including dozens of restaurants, boutiques, and lodging options of good value. People are friendly and the vibe is casual. You can safely get lost in your surroundings, from wandering the old town to joining one of the many tours that depart for Croatia’s countryside or nearby islands. Whatever you do, aim to visit in the off-season, when the crowds are fewer and you will more easily enjoy all there is to see and do. Read on for my 10 reasons (in random order) to travel solo in Split. 1. Explore Roman ruins by the sea. Half of Split’s old town is comprised of Diocletian’s Palace, named for the Roman emperor who reigned in the 4th century AD. The stone fortress and imperial residence is among the most stunning examples of ancient ruins found anywhere in the world. Today life goes on in and around the 38,700 square meters of the palace. Within the walled perimeter are a maze of streets, courtyards, and passageways with more than 200 buildings that are home to nearly 3,000 people. All this overlooks a harbor lined with palm trees. 2. Stay in an affordable Airbnb. For $37 USD a night, I stayed in a studio apartment in Split’s old town. The prime location and the whimsical decor sold me (see photo above.) The space also had a kitchen, bathroom, and balcony. In less than a minute, I could walk downstairs and browse the green market. In less than five minutes, I could walk to the harbor. Unfortunately, you won’t be able to stay in the apartment as it was when I went to Split. Though the space is currently listed on Airbnb, it has since been renovated and refurnished in a minimalist aesthetic. Gone are all those charming touches. There are still plenty of places to choose from in the short-term rentals market. View Airbnb stays in Split. 3. Shop like a local at the green market. Split’s green market, known as the stari pazar, clangs to life every morning around 6 a.m. On my first night in the studio apartment, I left the balcony door open for fresh air. Before sunrise, the screeching of metal stalls jolted me awake. Noise aside, one of my favorite things about Split was the green market. I visited the food stalls each morning to choose fruit, bread, and cheese for breakfast and lunch. Later, I sat on the apartment’s balcony above the market to eat and write, while watching the action on the street below. You could say I had the best seat in the old town. 4. Sail to Croatia’s version of Venice. 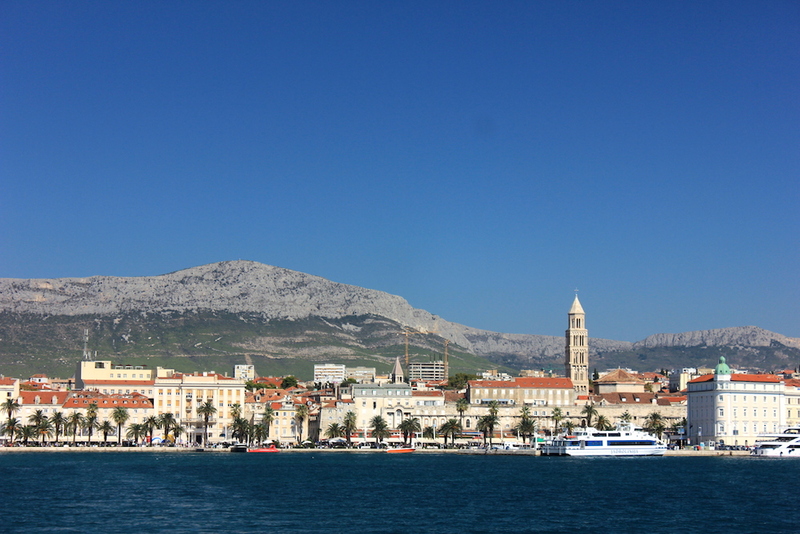 Split has a large port with boats that go to many destinations. I sailed to Trogir, a medieval town on a small island. The Venetians ruled here for almost four centuries, a time when the town flourished. This is a place with Italian-style piazzas, Romanesque churches, and architecture in the Renaissance and Baroque styles. It also has a riva or waterfront lined with cafes. While there, I toured St. Lawrence Cathedral and was especially intrigued by the gaudy relics on display in a back room. You can sail to Trogir on the Bura Line. Half a day will do on the island. If you plan to eat a meal, make sure to research restaurants beforehand (I took my chances and ended up in a tourist trap.) If you’re able to sail back in the early evening, the timing will be worth it. You’ll watch the sun set on the Dalmatian coast and enter Split’s twinkling harbor at night. It’s a sight to behold. Interested in delving more into Trogir’s sites? Read “20 Great Things to Do in Trogir” via Time Out Croatia. 5. Relax in a cozy bookstore. After a break in the bookstore, you’ll want to explore Pjaca, which has been the center of life for many in Split since the 13th century. 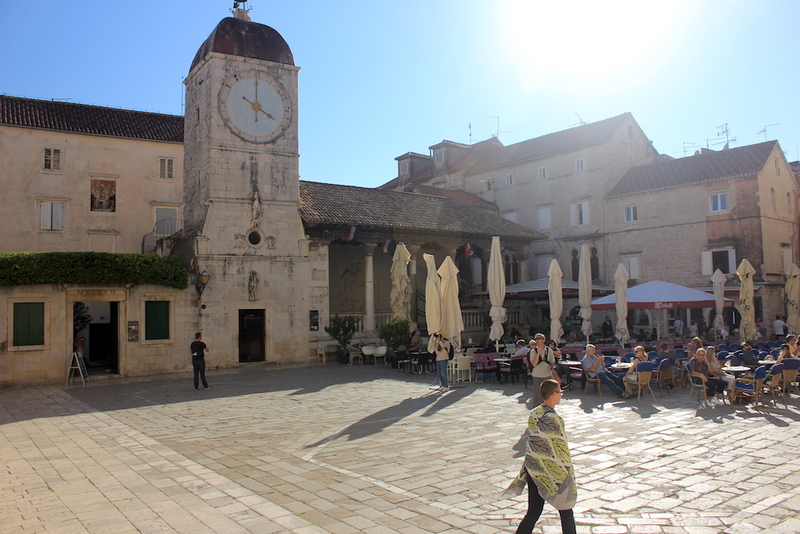 Diocletian’s Palace converges with the elegant homes of former nobility. The square is undergoing a conservation and restoration effort, according to Total Croatia News. Rumor has it Morpurgo will also see a second life. If so, you may want to time your future trip around the bookstore’s reopening. You can spend much of your time eating in Split. From casual to fancy, there are restaurants, cafes, and wine bars serving tasty food. Seafood is popular, as is meat. Some of the best things I ate were soparnik, a savory Dalmatian pie filled with Swiss chard found at the green market; raw berry fruit tart at Marta’s Veggie Fusion; mussels “buzara” in a broth of Prosek wine and figs at Zinfandel Food and Wine Bar,; and gelato at Moritz Eis. All of these places are casual and affordable. 7. Stroll the riviera at night. You can safely stroll the waterfront at night. Inside the palace walls, the old town bustles well past dinnertime. Musicians play in the courtyards. Have a drink, sit on the palace steps, and enjoy the music. Like anywhere else, be alert to your surroundings and head back to your lodging while the area is still active with people. 8. Plan a day trip to Plitvice Lakes. Split’s location on Croatia’s coastline means it is a popular departure point for tour operators, such as those leading day trips to the national parks in the country’s interior. At the top of my travel to-do list was hiking in Plitvice Lakes near the country’s mountainous border with Bosnia. Inside the park are 16 lakes, forest trails, and waterfalls. The turquoise lakes only make up 1 percent of the total park area but are the main draw for many, including myself. You’ll want to book your tour in advance as offerings fluctuate. I found my day tour on Viator and recommend the experience. The ride to Plitvice Lakes from Split took a few hours, however, the van was comfortable and our Croatian guide Natasha was a gifted storyteller who brought to life the history of Split, the land beyond, and Plitvice Lakes. 9. Move around easily with many transportation options. In Split, there are many good transportation options. The city has an airport with international connections as well as a bus station and a ferry port just outside the old town walls. I sailed from Dubrovnik to Split in four hours on a Jadrolinija high-speed ferry and then departed from the city via a bus to the airport and then a flight to Prague. Book your ferry ticket online before arriving in Croatia. The Jadrolinija website is clunky, but the ride itself is smooth and swift. The boat has plush seats, bathrooms, and a snack bar. I sat next to a pair of women from India and we chatted for some of the ride, later climbing to the boat’s upper deck to watch the sun set. 10. Treat yourself to some shopping. You’ll want to leave room in your suitcase to bring home a souvenir or two from Split. The old town is full of stores selling local products within the palace walls, from chocolate bars studded with figs to lavender soaps to leather accessories. For gourmet food souvenirs, head to Uje, which means “oil” in Croatian. Borovo sells leather shoes and sneakers for well under $100 USD (read about how it became Croatia’s hippest shoe company via Slate). To find a sale, look for bright signs on storefronts that say popust.